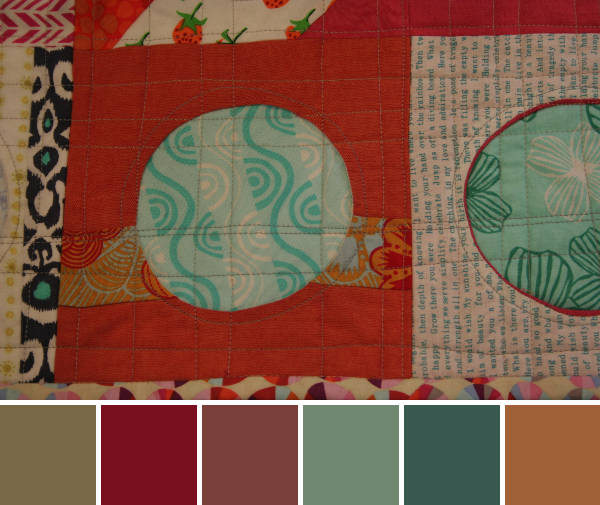 My hope for all of these color inspiration posts is that someone gets their creativity spark ignited and creates a gorgeous quilt or other work of art based upon one of my palettes. 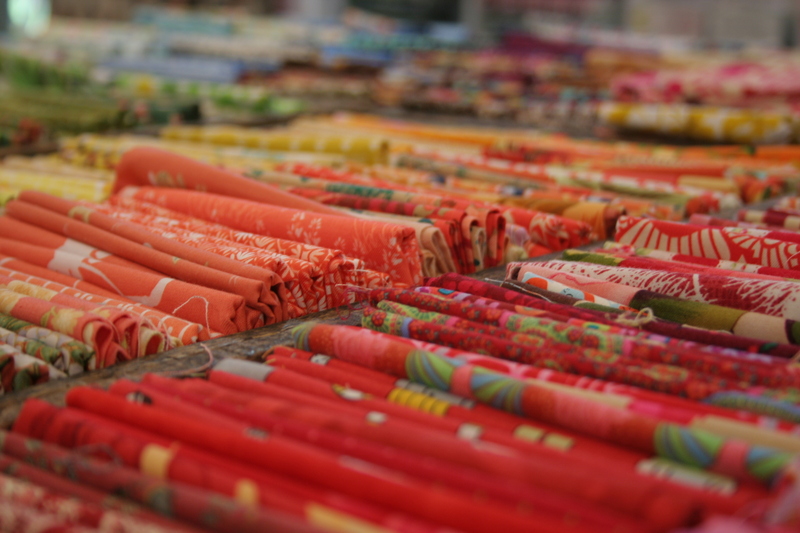 Since I and many of you are quilters or other fiber artists, where better to let inspiration strike than the fabric shop? 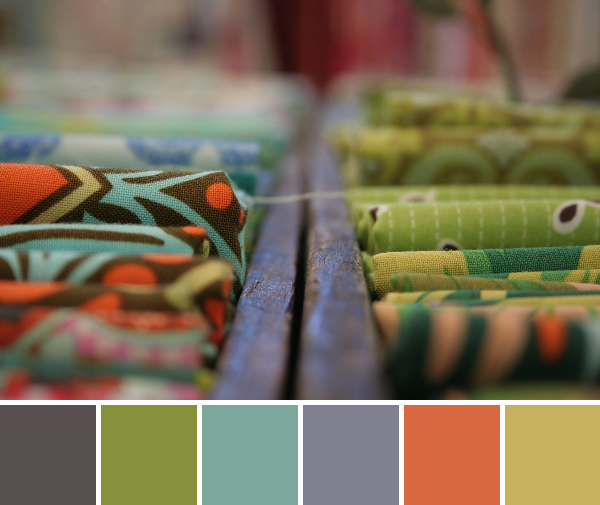 This week’s color inspiration comes from Alewives, a gorgeous fabric shop in Nobleboro, Maine. Palettes are made using my photographs and Play Crafts’ Palette Builder 2.1. 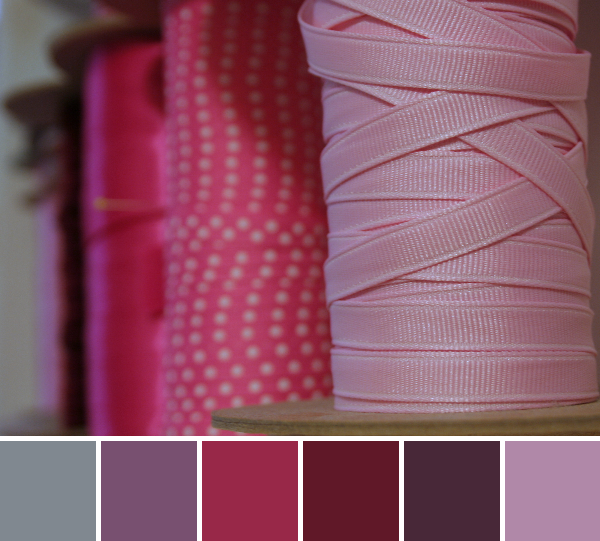 Wooden spools, assorted ribbons, and a lovely palette of pinks and purples. One of my favorite spots in Alewives is the collection of fat quarters in the center of the store. Arranged by color in awesome vintage wooden bins, these fabric bits beg to be touched, gazed upon with wonderment, and then (naturally) purchased. Yum! 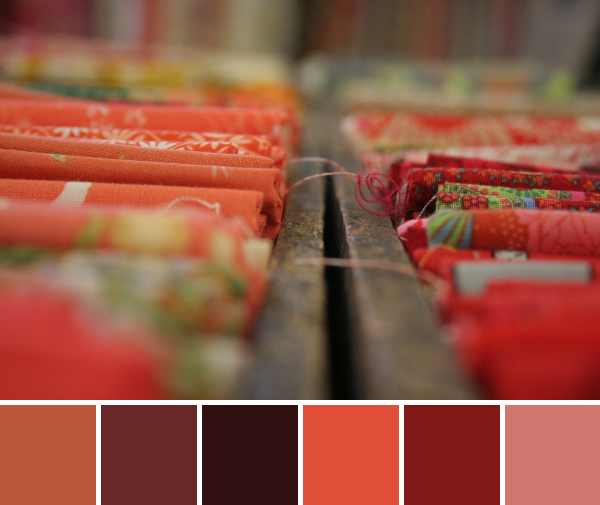 Fabric eye candy; how gorgeous is this fat quarter display!? Another gorgeous glimpse of the fat quarter bins. I could see this palette making its way into a lovely gender-neutral baby quilt. Or a soft, autumnal lap quilt or table runner. Or just about anything! I loved the color and fabric choices for this quilt display. Isn’t it wonderful when you walk into a shop and are not only swooning over the fabric, but are also are inspired by the quilts displayed around the shop?! I think the match of Kona Kelly to that darker teal is off, but you get the idea! Aurifil matches it as 2285 – Med Spruce, which looks like a more accurate match along with the 2850 – Med Juniper match for the Kona O.D. Green. 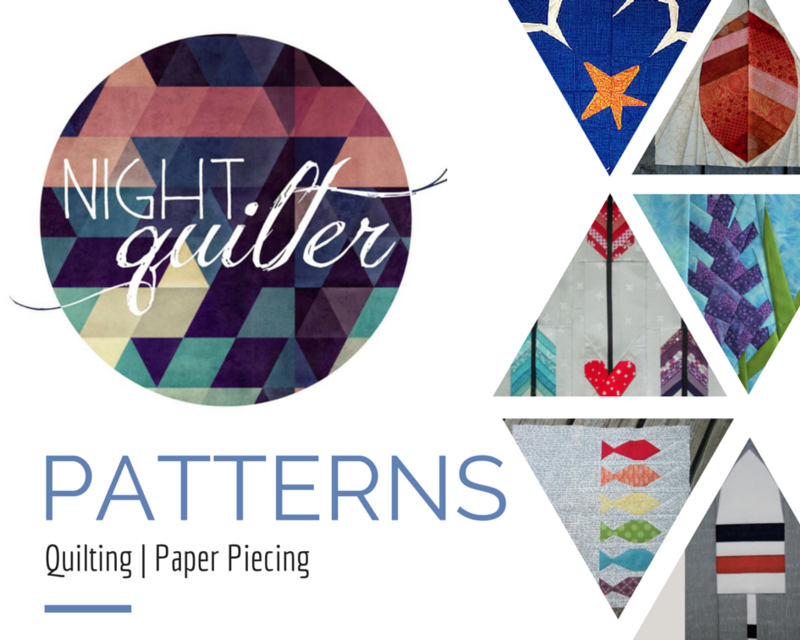 To see a few more glimpses of quilty beauty from the Alewives shop, visit my post Color for Quilters & the Maine Modern Quilt Guild. If you are ever in or near Nobleboro, Maine, I’d definitely recommend stopping in to Rhea’s shop. Tell her Kitty sent you! Note: I have no affiliation with Alewives Fabrics; I simply think it is a gorgeous, well stocked and kindly owned local fabric shop and I like to spread the love! Plus, It’s kind of awesome that their minimum fabric purchase online is 1/8 of a yard, AND that they will send you a 1/16 swatch if desired! That is hard to find with online shops! Enjoy browsing. Lovely! I had never heard of Alewives, so thanks for the tip.